Four young men — freezing cold, starving and struggling to survive following a plane crash — stood over their dead friend, armed with razor blades and broken glass. They cut their friend’s clothes. Surrounded by death following a 1972 Andes plane crash, the four men made the decision to live. “Each of us came to our own decision in our own time,” Canessa writes. “And once we had done so, it was irreversible. It was Friday the 13th of October in 1972 when an Uruguayan aircraft carrying the Old Christians rugby team and their friends and family went down in the mountains in Argentina, near the border with Chile. After two months, 16 survivors were rescued and became the inspiration for numerous documentaries, movies and books — most notably the 1993 film “Alive,” which was based on a book by the same name. Canessa was a 19-year-old medical student and rugby player at the time of the crash. In his new book, which will be published March 1, he remembers haunting moments. The one when the plane began to plummet and he held onto his seat with such strength that “I tore off chunks of fabric with my bare hands.” The one when an avalanche buried him, and his friend started “frantically digging handfuls of snow away from my mouth.” And the one when they heard over their transistor radio that the search for them had ended. But, it seems, the descent into cannibalism was the hardest to endure. Our common goal was to survive — but what we lacked was food. We had long since run out of the meagre pickings we’d found on the plane, and there was no vegetation or animal life to be found. After just a few days we were feeling the sensation of our own bodies consuming themselves just to remain alive. Before long we would become too weak to recover from starvation. The bodies of our friends and team-mates, preserved outside in the snow and ice, contained vital, life-giving protein that could help us survive. But could we do it? We wondered whether we were going mad even to contemplate such a thing. Had we turned into brute savages? Or was this the only sane thing to do? Truly, we were pushing the limits of our fear. Of the 45 passengers on the plane, 27 survived the crash. Then, one night, which Canessa calls “the worst of my life,” an avalanche killed eight more. “We had no food — even the frozen bodies we were relying on to stay alive had been swept away,” he writes, according to the Daily Mail. “Everyone was waiting for someone to do something. Or for no one to do anything and just let the end come. Canessa recalls that he had “already done things that I never in my darkest nightmares imagined I’d have to do” — and he knew he had to do them again. After a gut-wrenching 72 days on their own, the final 16 survivors were finally rescued on Dec. 23, 1972. But Canessa said he agonized over what they had done and how others would feel about it. He recently talked to People magazine about seeing his mother and father after he was saved. Canessa told his father that his main concern was how the victims’ families would react to the harsh reality. Canessa, now a pediatric cardiologist, said it was his family — and the determination to make it home to them — that gave him the strength to survive. Becoming very “powerful” is easy. Becoming very “reach” is easy. Becoming very “powerful” and very “reach” is easy. Pharmacology has been one of the subjects that I have studied during my long presence in university libraries. According to my elementary knowledge on this subject, a medicine able to remove, from human experience, exclusively, the empathy, yet, does not exist. Without being certain, I believe that, the removal of empathy by medication is accompanied by the simultaneous, almost complete removal of all the emotions and shrinkage of the time-horizon to +/- 1 day; though I could be wrong. The easiest method for, either, becoming very “powerful”, or, becoming very “reach”, is, bluntly, the ancient algorythm of the pimp; which is also named, entryism. Normally, the human nature protects the human beings from resorting to this method through the homeostatic inner restrain of empathy. Cohabitation without mutual trust is the definition of living in a jungle. The things which are, currently, happening in Europe reveal the covert inhomogeneity between, the projected quality of civilization and the embeded one. The colonizing Nations are, “powerful” and “reach”; we should take, this, for granted. But still, what we should, and what we should not, do about that? - Should we satisfy even their immoral demands just to please them? And if yes, then, what? The colonizers, from what it seems, pursue, an almost “immortality”; “flexible” identities; “obscure” ownership; and boudless “entertaiment”. If we dare to, traumatize the “youth”; and, sacrifice the “guidance”; and restrict the “longtitude” of the human “inspiration” into a 2 days gap, then, what? P.S. : Franz Stigler, my hero, remains a positive example of a strong and moral character. A pilot glanced outside his cockpit and froze. He blinked hard and looked again, hoping it was just a mirage. But his co-pilot stared at the same horrible vision. “My God, this is a nightmare,” the co-pilot said.”He’s going to destroy us,” the pilot agreed. Alone with the crippled bomber, Stigler changed his mission. He nodded at the American pilot and began flying in formation so German anti-aircraft gunners on the ground wouldn’t shoot down the slow-moving bomber. (The Luftwaffe had B-17’s of its own, shot down and rebuilt for secret missions and training.) 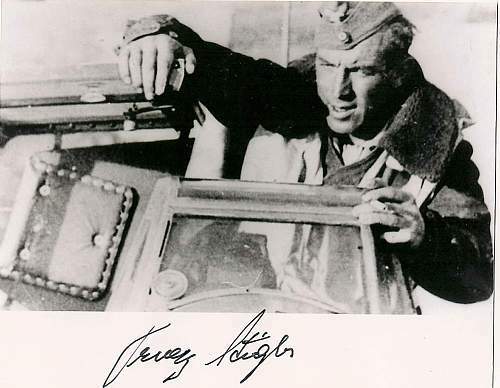 Stigler escorted the bomber over the North Sea and took one last look at the American Pilot. Then he saluted him, peeled his fighter away, and returned to Germany. “Good luck,” Stigler said to himself. “You’re in God’s hands now.” Franz Stigler didn’t think the big B-17 could make it back to England and wondered for years what happened to the American pilot and crew he encountered in combat. As he watched the German fighter peel away that December day, 2nd Lt. Charles Brown wasn’t thinking of the philosophical connection between enemies. He was thinking of survival. He flew his crippled plane, filled with wounded, back to his base in England and landed with one of four engines knocked out, one failing, and barely any fuel left. After his bomber came to a stop, he leaned back in his chair and put a hand over a pocket Bible he kept in his flight jacket. Then he sat in silence. Brown flew more missions before the war ended. Life moved on. He got married, had two daughters, supervised foreign aid for the U.S. State Department during the Vietnam War, and eventually retired to Florida. Brown took on a new mission. He had to find that German Pilot. Who was he? Why did he save my life? He scoured Military Archives in the U.S. and England. He attended a Pilots’ Reunion and shared his story. He finally placed an ad in a German Newsletter for former Luftwaffe Pilots, retelling the story and asking if anyone knew the Pilot. He had had left Germany after the war and moved to Vancouver, British Columbia in 1953. He became a prosperous businessman. Now retired, Stigler told Brown that he would be in Florida come summer, and “it sure would be nice to talk about our encounter.” Brown was so excited, though, that he couldn’t wait to see Stigler. He called Directory Assistance for Vancouver and asked whether there was a number for a Franz Stigler. He dialed the number, and Stigler picked up. Brown had written a letter of thanks to Stigler, but one day he showed the extent of his gratitude. He organized a reunion of his surviving crew members along with their extended families. He invited Stigler as a Guest of Honor. During the reunion, a video was played showing all the faces of the people that now lived–children, grandchildren, relatives–because of Stigler’s act of chivalry. Stigler watched the film from his Seat of Honor. After he died, Warner was searching through Brown’s library when she came across a book on German fighter jets. Stigler had given the book to Brown. Both were country boys who loved to read about planes. “In 1940, I lost my only brother as a night fighter. On the 20th of December, 4 days before Christmas, I had the chance to save a B-17 from her destruction, a plane so badly damaged, it was a wonder that she was still flying. The pilot, Charlie Brown, is for me as precious as my brother was. Thanks Charlie.